Mr. Humble has a serious thing for peanut butter cups. So I decided to indulge this chocolate-peanut butter beast of his by whipping up a giant peanut butter cup... well, a chocolate terrine cup. 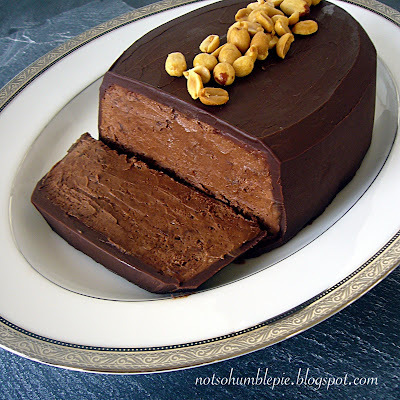 Filled with a light and silky chocolate peanut butter mousse. This can be put together over an afternoon, but I recommend letting the mousse chill in the terrine overnight so that is as firm as possible when you glaze it. Line a terrine or a loaf pan with plastic wrap and place in the freezer to chill. In a double boiler combine the chocolate, peanut butter and the butter and melt, stirring till smooth. Just to be safe, I'll just make a little reminder: you do not want the water in your double boiler to ever touch the bottom of the pan you're working the ingredients in. The water should also be at low simmer, not a rolling boil, so you don't overcook the eggs or chocolate. Back to the mousse. Remove the chocolate/peanut butter mixture from the double boiler and set aside. In a second bowl that will also also go on the double boiler, whisk together the egg yolks and 2 tablespoons of the sugar. Place on the double boiler and whisk a couple minutes until it has thickened slightly and then remove from heat. Add a little of your chocolate peanut butter mixture to the egg yolks and mix to temper. Add this mixture back into the chocolate bowl and combine. In a third bowl (I know, lots of dirty dishes) whip the heavy cream and remaining 2 tablespoons sugar together until you have soft peaks. Working in thirds, add the cream to the chocolate and gently fold to combine. Remove your now cold terrine from the freezer and pour in the mousse. Cover with plastic wrap and chill in the refrigerator for at least 4 hours. To make the glaze combine all the ingredients over a double boiler and mix until smooth and satiny. Once your terrine is thoroughly chilled you can remove the mousse and peel off the plastic wrap. Using a wet offset spatula I smooth down any wrinkles left by the plastic. I also had to smooth out a big thumb impression because someone in the Humble household decided to poke my terrine while it was chilling. Once everything is touched up on the mousse, it is time to pour on the glaze. Smooth the glaze over the mousse with a spatula and return to the refrigerator for 10-20 minutes until it is firm. Sprinkle with peanuts and cut with a warm wet knife. Serve up a big slice to Mr. Humble with a dollop of guilt for poking the terrine like a curious toddler. This looks incredible! What a beautiful and elegant dessert! um, omgoodness. i want this right now. so delicious looking, thanks for sharing!!! mmmm...cant wait to give this one a go! de!lic!!ous! I know I'm late to the posting party on this one, but how did you get that shape? Did you use a special pan (I can only find long rectangular terrine pans online) or did you shape the mousse after it was in a regular loaf pan before you glazed it?